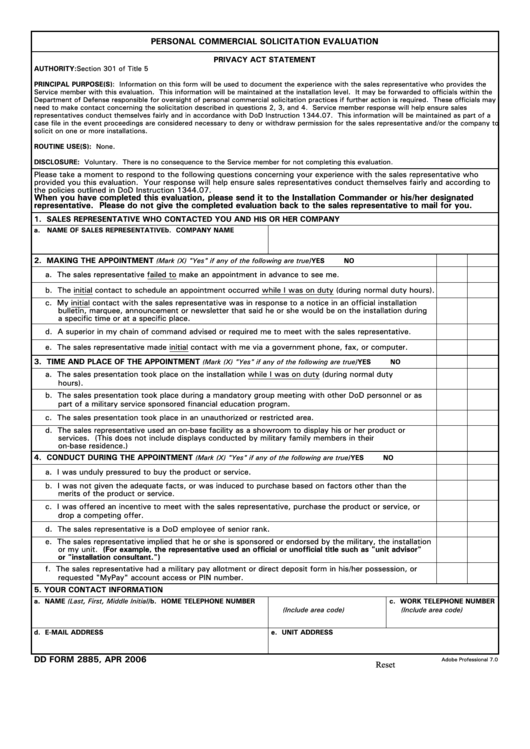 Download a blank fillable Dd Form 2885 - Personal Commercial Solicitation Evaluation in PDF format just by clicking the "DOWNLOAD PDF" button. Complete Dd Form 2885 - Personal Commercial Solicitation Evaluation with your personal data - all interactive fields are highlighted in places where you should type, access drop-down lists or select multiple-choice options. AUTHORITY: Section 301 of Title 5 U.S.C. solicit on one or more installations. DISCLOSURE: Voluntary. There is no consequence to the Service member for not completing this evaluation. the policies outlined in DoD Instruction 1344.07.
representative. Please do not give the completed evaluation back to the sales representative to mail for you. a. The sales representative failed to make an appointment in advance to see me. b. The initial contact to schedule an appointment occurred while I was on duty (during normal duty hours). a specific time or at a specific place. d. A superior in my chain of command advised or required me to meet with the sales representative. e. The sales representative made initial contact with me via a government phone, fax, or computer. part of a military service sponsored financial education program. c. The sales presentation took place in an unauthorized or restricted area. a. I was unduly pressured to buy the product or service. merits of the product or service. d. The sales representative is a DoD employee of senior rank. or my unit. (For example, the representative used an official or unofficial title such as "unit advisor"
requested "MyPay" account access or PIN number.